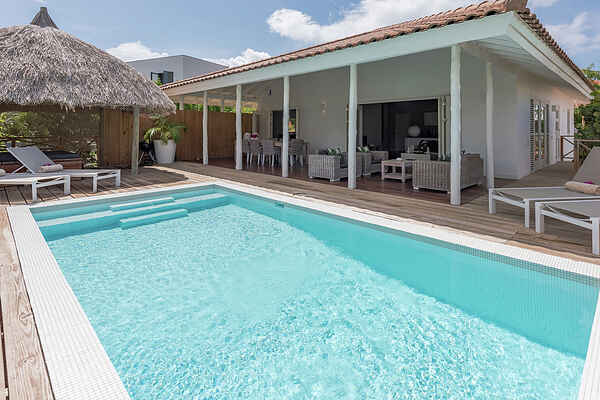 Villa Dolce Vita is located in one of the prettiest locations of Curaçao, a beautiful villa with a private pool, at walking distance of the popular Jan Thiel Beach. The villa lies in the Jan Thiel district in Willemstad and has place for 4 people. The luxuriously decorated detached Villa Dolce Vita has a spacious living room with open kitchen which is completely furnished and supplied with all amenities. A large dining table with 8 chairs and a lounge set complete the beautiful veranda. Here you can spend long, cozy evenings. In the large garden you will find your own private swimming pool and lovely palapa (parasol made of palm tree leaves) where you can relax. This villa is perfectly maintained and guarantees a wonderful holiday. Willemstad is the capital of Curaçao. The city district encompasses multiple neighbourhoods, of which Punda and Otrabanda have always been the most important districts. The eastern wharf of Sint Anna Bay is lined with façades characteristic of Old Dutch architecture. Because, according to Caribbean standard practice, these are painted in vibrant colors, a stunning row of façades was created that, individually or altogether, make for an excellent photograph.